With training from manufacturers of the best fireproofing materials on the market today, our knowledgeable staff is able to get the job done efficiently and on schedule. 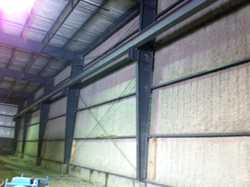 HiBAR® is a ULC-listed, spray-applied mineral fibre insulation for fire rating structural steel. It is a blend of specially manufactured inorganic mineral fibres and proprietary binders that contain no asbestos or free crystalline silica. HiBAR® can be spray-applied over rigid structural substrates and exterior or partition walls. HiBAR® also has thermal and acoustical properties. As a treatment for ceilings and walls, it is ideal for noisy production areas or large rooms such as gymnasiums or swimming pools where both sound absorption and aesthetic enhancement is desired. Condensation control is also provided on exposed structural components that are in contact with cold exterior surfaces.